As I read this book, I kept noting how easy it was to read, how the story it told was remarkable and how it overall was a very pleasant and interesting read. It is simply a "good book." Ash's work tells the tale of African-American men formed into two regiments on the Sea Islands off the coast of South Carolina, and how these men grew into their roles as soldiers, as well as how their performance influenced public opinion in the North about the capability of African-Americans to become dependable soldiers. Their foray onto the mainland of Florida is a remarkable, yet still little-known story. This is a very enjoyable and informative book. It goes into detail about this remarkable event in the Civil War, just a few weeks after President Lincoln's Emancipation Proclamation had authorized the recruitment of African-American troops, yet before the Federal government began a serious attempt at this kind of recruitment. It is well-written and easily readable, which undoubtedly added to my enjoyment. Not only does Ash describe how Colonel Thomas Wentworth Higginson took charge of these men and molded them into a competent and disciplined military unit, but he shows how the Colonel developed his plans to put these men to the test in terms of their military ability. 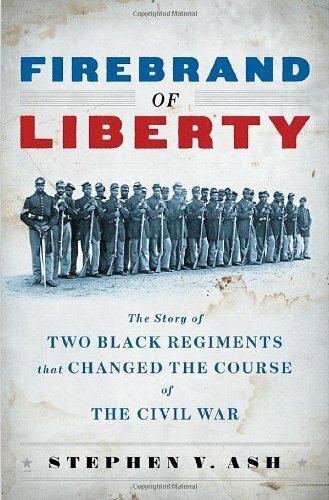 This book demonstrates that Higginson hoped that these troops would prove that the idea of recruiting African-Americans was not folly and that these men could and would fight as well as anybody else. He hoped this local campaign would have national consequences. Higginson developed a fine rapport with these men and this combination of New England abolitionist and southern African-Americans enjoyed very good success together. After a couple of small local raids, he led a regiment named the 1st South Carolina Volunteer Infantry (later renamed the 33rd United States Colored Troops, though the men continued to refer to themselves under their original designation) into a bigger, expedition, which Higginson hoped would result in huge rewards in the fight against slavery. With help from the 2nd South Carolina Volunteer Infantry (another group of African-Americans) and support from a two white regiments and the navy, Higginson took the men onto "the main" as the men called the mainland and seized Jacksonville, Florida, beginning what Higginson envisioned as an aggressive war on slavery. Ash describes in detail the progress of this adventure through the winding St. Johns's river to Jacksonville and the beginnings of movements beyond this town, along with reports of the performances of the troops. He details the thoughts, fears and hopes Higginson experienced on this journey, relying heavily on Higginson's writings throughout the book. Unfortunately, before all of the hopes and dreams Higginson and his men had could be realized, and before any serious impact upon slavery in the region had been achieved, General David Hunter, commander of the Department of the South, recalled the men back to the Sea Islands, leaving them feeling unfulfilled about their mission. Ash discusses the shock and disappointment that Saxton, Higginson and the men felt upon learning of the orders to leave Jacksonville.These feelings contributed to the troops - black, but seemingly mostly white - to burn many sections of this town. At the end of the book, Ash strongly argues that the behavior and performance of the men during their excursion greatly influenced the decision of Abraham Lincoln and his cabinet to proceed with a more serious recruitment of African-American troops throughout for the entire Union army. Edwin Stanton's order to Lorenzo Thomas to go to the Mississippi Valley and begin such recruitment in earnest was issued on March 25, just a few days before Higginson's troops were recalled from the mainland, and while newspaper coverage of this expedition was widespread in the north. He also offers a few intriguing "might-have-beens" about results this campaign could have produced with some more time and support, or expansion into other areas. It is quite a thought provoking section. The book is not long, at 204 pages, plus an epilogue and an appendix, but it covers the subject very well and in-depth, especially once it got into the story of the expedition, yet it does so in a pleasing, readable way. It is good scholarship, but without the purely academic style of writing that many history books feature. It does include two helpful maps at the very beginning of the book, but it may have been nice to have a couple more details versions of them throughout the book, in the sections describing the various locations the soldiers visited. It is not a serious flaw in the book, but this is one of the rare times where even I - not a big "map" person - would have liked more views of just how each of these small towns related to each other location-wise without needing to turn back to the front of the book. 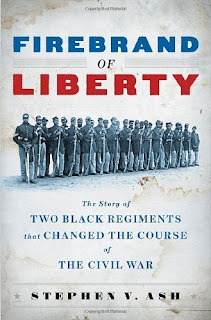 Overall, I definitely and happily recommend this book, not only to those interested in African-American soldiers during the Civil War, but also to those who simply like a good story and like to read something new about the Civil war. This still little-discussed expedition of African-American troops during the middle year of the Civil War (yet at the beginning of the use of African-Americans in the army) serves as a great story of skill and courage on the part of the soldiers and their leaders and just may have been influential enough to accomplish the deed mentioned in the book's subtitle which claims these regiments "changed the course of the Civil War." I greatly enjoyed this book also. Readers will also appreciate Army Life in A Black Regiment - Higginson's memoir. Higginson was a major literary figure in his life time. Thanks for the suggestion. I've seen comments about Higginson's literary reputation and I believe it was he who published Emily Dickinson's work. I may have to buy a copy of his book.